If you continue on the road past the entrance to Ffynone Mansion for a few hundred yards you will come to a good sized parking area on your right. Park and then take off along the track which twists and turns and rises and falls and eventually you will come to an area with a small pool and stream. 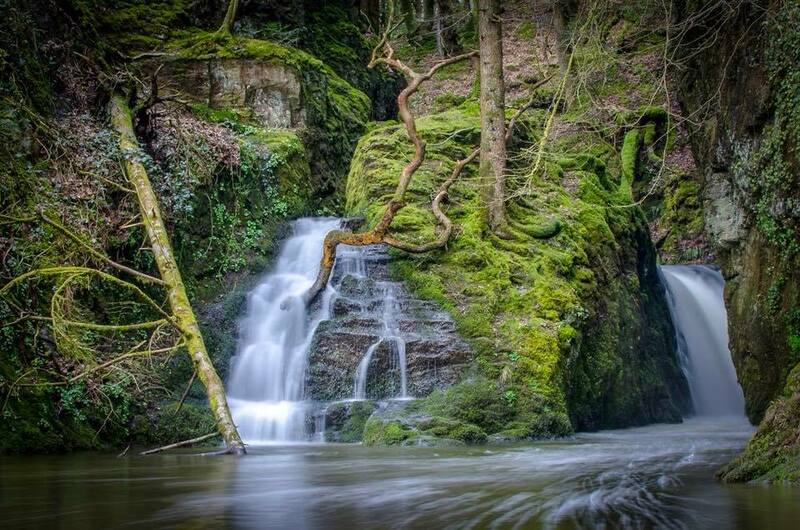 On your right will be the Ffynone Falls – not the biggest in Wales but definitely one with its own delightful charm. The whole area has been bought from the Ffynone Estates by a non-profit worker’s co-operative called Growing Heart/Calon yn Tyfu set up as recently as 1996, www.growingheart.co.uk. This extensive piece of woodland was one of two bought in 2006 where they have already planted more than a million broad-leaf trees as part of a ‘woods for all’ commitment. Their target in the Ffynone woods is to clear the crass conifer plantation undertaken 1950s and substitute native broadleaves more appropriate to the area.